Paris might be for lovers, but solo travellers also find romantic treats at almost every turn. 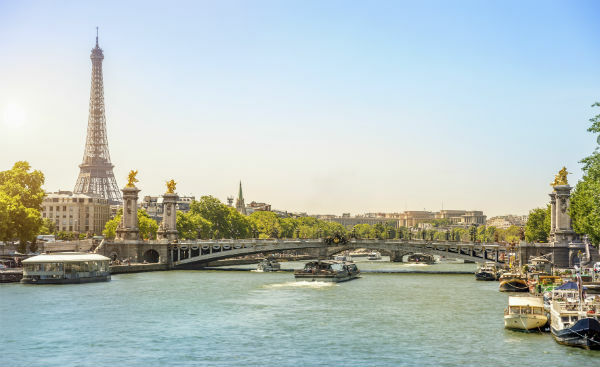 Witness Paris’s glorious heritage from the banks of the River Seine, a UNESCO site, home to the Louvre, Eiffel Tower and of course the Cathedral of Notre-Dame. Then climb up to the bleach-white Sacré Coeur with its street artists at Montmartre. Paris’ exquisite cuisine, chic boutiques and outstanding cultural scene are all perfect for enjoying the finer things in life. Tired of romantic couples and friends chatting over long, drawn out meals? Then opt for a picnic in a park or eat at a restaurant terrace, perhaps with a bit of street theatre to entertain you between bites. Paris is well endowed with Michelin restaurants such as the three-starred Arpège, Paris’ highest ranking in the World’s 50 Best Restaurants list. Paris also caters well for vegan and vegetarian diets. Meetup.com is popular, as is the Expatriates in Paris Facebook group. OnVa Sortir organises a variety of group meetings from happy hours to walks along the Seine for free. For some peace, stroll along Viaduc des Arts and La Promenade Plantée (Metro: Bastille). Locals call it La Coulée Verte (the green alley) due to its lush greenery, away from the busy roads. The packed, efficient Paris Metro is an underground experience in itself. A Paris Travel card could keep your costs down, or sign up for the Uber app which gets you a low cost lift to anywhere you want in Paris. Paris is safe for single women provided you use basic common sense, just like back home. Le Marais is Paris’ LGBT epicentre but you’ll find welcoming venues all over the city. Backpackers and budget travellers will find budget hostels all over central Paris. Nice is like a mini Paris, it’s all things French in a compact city. A magnet for sun-seekers and beach lovers, Nice has offered sheer luxury since the 19th century and taking afternoon tea at the historic Hotel Negresco is an iconic and nostalgic treat. This magnificent coastal city also offers bustling markets, a beautiful old town, elegant architecture and an abundance of chic bars and restaurants. When you’re ready for some peace, take a wander through the ancient Parc du Château for green spaces and stunning views over the old town. If you’re travelling alone but would like some company, meet up groups are numerous in Nice, so whatever your preference – yoga, football, hiking, French language or anything else – there’s a group for you. Backpackers are well catered for in the numerous hostels throughout the city. Eating out in Nice is a treat and the city hosts several Michelin star restaurants, There are also some excellent vegetarian eateries too – feel free to eat alone without getting bothered. Nice is environmentally conscious and the favoured forms of transport are modern buses, trams and bicycles (bike rentals are plentiful). Alternatively, you could sign up to the Uber app which gets you a low cost lift to anywhere you want to go in Nice – maybe even a quick jaunt to Monaco, just under 21 kilometres away. Besides Nice’s Queernaval and Pink Parade, the famous Rainbow Power, MADmoiZelles evenings and Dolly, Soirées Glda are gay parties not to be missed. Neither should you forget the In&Out and Zefestival festivals. Females travelling alone should not encounter any problems but try to avoid the beach area and the train station surroundings late in the evening. An ambitious urban renewal programme has seen Bordeaux transform itself into one of France’s most vibrant cities. Pedestrianised boulevards, beautifully restored neoclassical architecture, a high-tech public transport system and reclaimed industrial docks at Bassin à Flots, all go to make Bordeaux the wonder it is today. Half the city is UNESCO-listed, making it the largest urban World Heritage site. Top architects have introduced striking new buildings to contrast the traditional Bordeaux, such as the Nouveau Stade de Bordeaux, the decanter-shaped La Cité du Vin and the Jean-Jacques Bosc Bridge straddling the River Garonne. A large student population adds to Bordeaux’s excitement. You’ll also find exceptional restaurants, including several dedicated vegetarian venues, along with fine wines and chic brasseries lining most streets. The excellent new tram system is a good way to tour Bordeaux and with a day ticket costing no more than a quick snack, it’s great value. If you’d prefer a cab, the handy Uber app can connect you with a reliable ride in minutes. For a little peace from the city, head for the popular beachside resort of Arcachon, just 55k kilometres south of the city. Its Pyla Dune is the biggest sand dune in Europe – scale the top for spectacular views, then drop in at one of the oyster farms to sample fresh oysters and to round off a good day out. Meet-ups are a great way to get in touch with like-minded people who share common interests. There’s plenty of luxurious hotels and if you’re backpacking, safe budget accommodation is readily available. Bordeaux is safe for women travelling alone provided you exercise the usual caution when out and about. The city has many gay-friendly businesses with plenty going on for the LGBT community, including Gay Pride in June.